Spring has sprung! Want some fun ways to get yourself stronger and leaner for the summer while doing something great for your community? 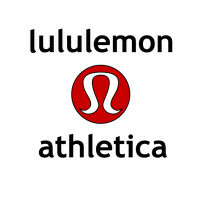 This event will bring you a 45min open levels yoga flow followed by 45min AYFit. 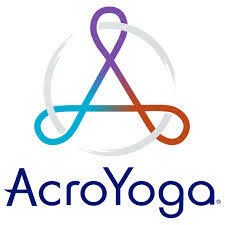 AYFit is a community fitness program developed by Acroyoga.org, and designed to build smart, toned, coordinated muscles in a safe, fun & progressive environment. AYfit is about working individually and with partners to build smart, intelligent muscles with acrobatic body weight exercises. Success is measured by how skillfully & efficiently we support people. AYFit is a balanced, progressive training for spirit, mind and body. 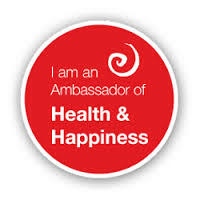 Currently, there are around 275 AYfit trainers around the global. The AYFit system will contribute to strength and endurance, as well as assist in creating stability and integrity around the joints to help correct muscle imbalances. AYFit Trainers are instructed in how to share the system of fitness at the appropriate level of each participant. This event is capped to 21 people. Sign up early. $2 to commit your spot online. Live music with local DJ with provide pumped up energy for the event. There is a community social after with drinks and healthy snacks provided. Align2Fly is a blend of acroyoga, alignment based yoga, partner functional fitness, core power fusion, counterbalance flows, non traditional duo conditioning, and love for flight. Acroyoga is a fun way to challenge your body through elements of yoga and partner acrobatics to create a dynamic challenge filled with laughter. This workshop series is designed for those who may be curious about acro asanas and flight foundations. There will be three over the course of 4 weeks. Dates are all Sundays 2:30-4:30pm: 2/21, 2/28, 3/13. Come to one or come to all!! I promise you a solid foundation to help you get going with anatomy and alignment in mind for safe play. This series of three 2 hour “level 1/2” clinic series can be taken individually, non-sequentially. However, after all three sessions, you will develop an appreciation and have a foundation to safe and powerful flights that will be flowing and fun. No partner necessary. This will be a great way to meet new people in your community while adding an exciting twist to your yoga practice. We will dissect anatomy while honing your connection with your asanas and your community. 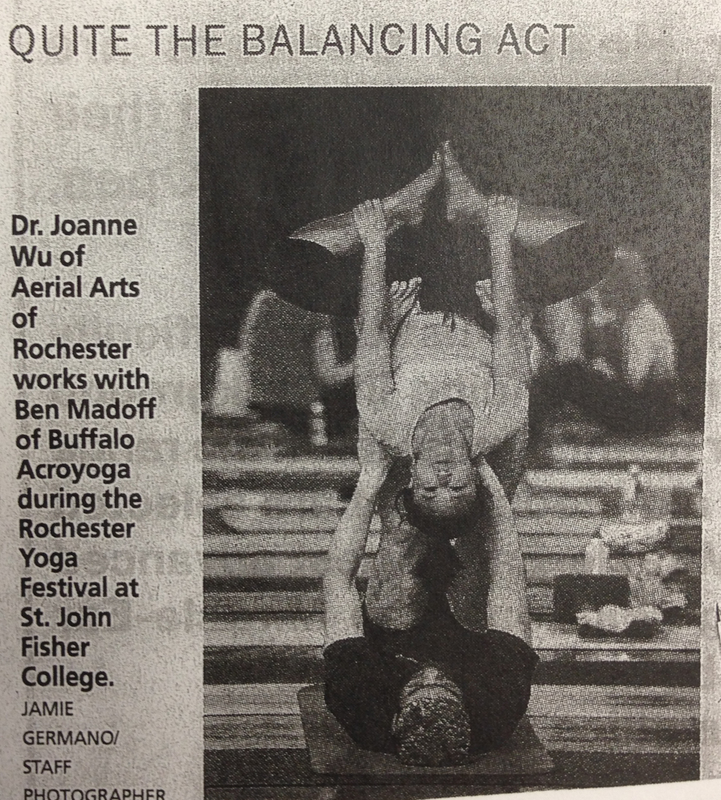 This workshop series will be assisted by Joanne’s friend, Acro partner and fellow Acroyoga JAMbassador Ben Madoff. Join Megan Callahan and Dr. Joanne Wu for this workshop, which is focused on rehabilitation and is good for those working through injuries or even yogis who would just like to take a gentler approach to their yoga practice. Strong emphasis will be on proper alignment of foundational postures. The Great Yoga Wall is a modern, updated version of the “rope wall” first developed and refined by the late B.K.S Iyengar, the father of therapeutic yoga. Instead of using traditional ropes this innovative system uses more comfortable straps and slings. The Great Yoga Wall is an invaluable tool for those who are stiff, weak, or unable to attain a certain posture independently. It supports the body and reduces the weight placed joints and muscles. This support allows for proper development of each posture, core strength and stability. Using the rope wall can also deepen an existing practice. Since your body is anchored and supported by the straps you are able to stay in postures longer giving you the ability to refine your breathing and the posture itself. This amazing wall system, the only one in the city of Buffalo, can be a wonderful asset for you on the path of starting or expanding your practice. Please join us for our upcoming yoga wall workshops and feel the difference for yourself! 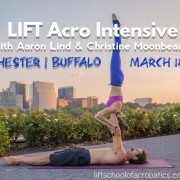 Join experienced teachers Aaron Lind and Christine Moonbeam for a fun and educational weekend of partner acrobatics! During the course of the weekend we will train the elemental building blocks of washing machines that spin horizontally and vertically, as well as building the foundations of dynamic acrobatics that use momentum to swing the flyer from pose to pose. All Levels welcome! Progressions will allow beginners to feel degrees of sucess in the workshop. Spotting, safety, and critical thinking about acrobatics will be key elements in addition to instruction given about the mechanics of partner acrobatic skills. Lateral Spinning washing machines: Break down complex base foot work and flyer weight shifting for washing machines that spin on a horizontal axis. Propellor and Ninja Star will be used as examples of combinations of movement patterns that lead to further and more complex possibilities. Learn the mechanics that make up tricks to create your own! Intro to Whips: Whips are are fast, exciting, swinging movements. Flyers will learn how to create pivots on various body parts and generate momentum. Bases will learn how to support momentum with precise knee and ankle movements. Whips require advanced spotting awareness, so learning how to spot will be a key feature of this class. Lift School of Acrobatics is known for it’s methodical and progressive approach to acrobatics teaching, as well as a play and supportive learning environment.